Posted on Thu, Nov 10, 2011 : 8 a.m. Popcorn is the official state snack food of Illinois. I'm not much of a popcorn fan — I can eat it, but don't really care if I ever do. However, I know I'm in a distinct minority with regard to my lack of affection for this treat. Michigan will be playing Illinois this Saturday, so it only seemed appropriate to feature popcorn in today's post. But I had to glam it up a bit. I debated whether to make a sweet or savory version, or whether to make cute little football-shaped popcorn balls. I'm offering something completely fabulous which features an utter lack of redeeming nutritional value (which is, of course, why it's so fabulous!). Even though I can usually live without popcorn, I think I could actually start craving this. 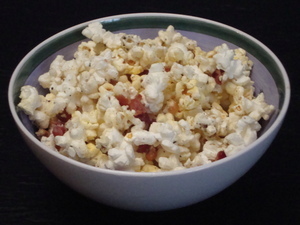 Today's recipe is for Bacon-Parmesan Popcorn. Yup — salty, crunchy, cheesy, and with bacon. Supreme snack food! This is ideal for tailgating or for watching the game at home. It's a great treat for any occasion, from watching the Oscars to watching a movie. Truly, how can you go wrong with anything that has bacon? Prepare popcorn according to package directions, then place into a large mixing bowl. Meanwhile, place bacon into a large skillet and cook, turning occasionally, until very crisp. Remove bacon from skillet and crumble; reserve the bacon fat. Add oil and crumbled bacon to the bacon fat; pour over the popcorn and toss to combine. Sprinkle seasoning and Parmesan over the popcorn, and toss to combine well. Makes approximately 8 cups of popcorn. Starting next Thursday, November 17, I'm going to have "office hours" (to use university lingo) on Thursdays from 4 - 5 p.m. in the AnnArbor.com Community Space. Stop by, chitchat, schmooze, ask questions, have a cup of coffee, tell me what you're planning to make for dinner ... just come say "hi!"